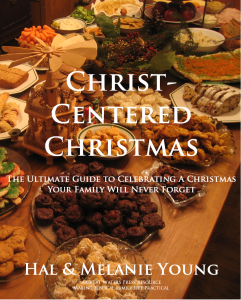 Today I had the opportunity to review a new eBook, Christ-Centered Christmas, by my friends Hal & Melanie Young, authors of Raising Real Men. It’s really a remarkable, immensely practical book with an appropriate sub-title: The Ultimate Guide to Celebrating a Christmas Your Family Will Never Forget. Are you feeling torn about Christmas? Loving the sights and smells, but hating the thought of the stress and commercialism? Want to make sure the Lord is glorified in your family, but wondering if you’ll get sidetracked by all the busyness? You’re in good company! Purchase this gorgeous 80 page, full color eBook now!